James in her Hyde Park neighborhood. James grew up in and around Bronzeville. She returned to Chicago in 2017 after studying English at Howard University in Washington, D.C. Numerous job opportunities, and a thriving Black professional class, typically keep recent D.C.-area graduates in the Chocolate City. There is a clearer route to success for Black people there, one that isn’t so clear for Black people in Chicago. Yet a fellowship at the University of Chicago brought James back to Chicago. She originally thought her stint in the city would be temporary, but she ultimately found her purpose at home: merging her love for law with art. With a job teaching artists at the youth literary arts hub Young Chicago Authors, nothing can lure James out of Chicago. James also knew she didn’t want to leave the South Side for the luxuries and conveniences of the North Side. Maya Roberts, 31, also left Chicago for college in Ohio. 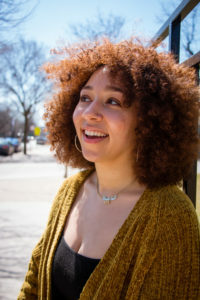 When she graduated from the historically-Black Central State University in 2009, she moved back home; first with her parents in Galewood and then to Logan Square, where she’s been for the last six years. “I like Logan Square. I’m sometimes of two minds about it. I know [that] I, even as a Black person, gentrified the neighborhood when I moved in, just by virtue of having a college degree and other things,” Roberts says. Recent college graduates across all economic backgrounds tend to look for living spaces that offer similar, if not better, resources as their campus experience. 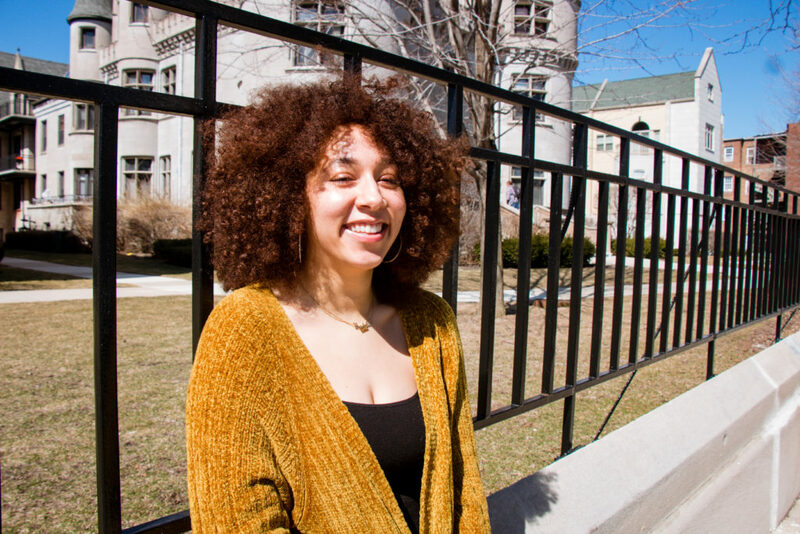 Already in the middle class before college, Roberts’ degree made her somewhat extrinsic to the low-income Latino residents who have lived in Logan Square long before she did. 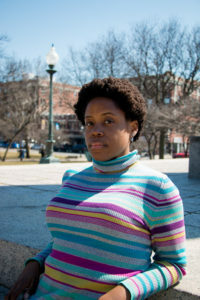 Maya Roberts, 31, poses outside the Logan Square Blue Line train station. In 2000, Latinos made up 65 percent of the neighborhood. By 2014, they made up less than 47 percent. Though Black people didn’t populate the neighborhood as much as Latinos, those who were living there have left too. White people currently make up most of the population in Logan Square. 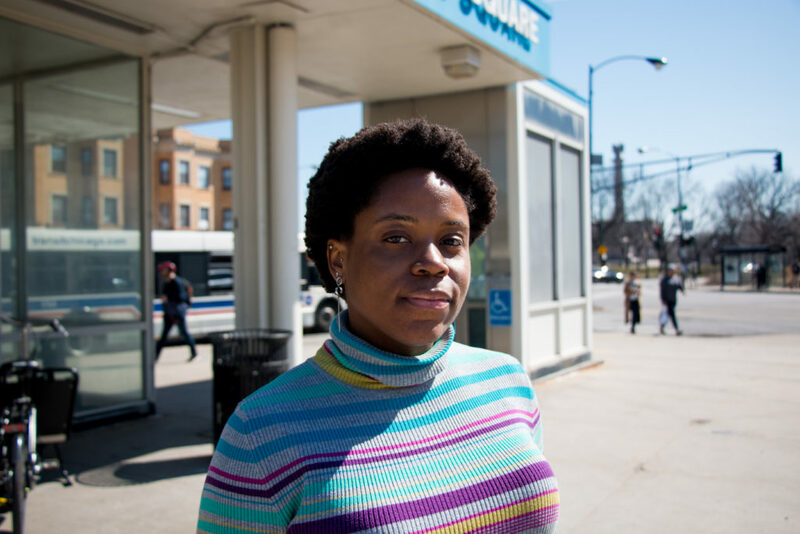 Since newly gentrified neighborhoods like Logan Square are becoming more and more expensive, Black millennials like Roberts are considering moves to communities like North Lawndale. However, disinvestment in the West Side neighborhood has stood so long that North Lawndale is essentially unattractive to Black millennials fresh out of college. Roberts chilling in Logan Square. Initially Roberts’ loyalty to her native West Side wouldn’t let her consider housing options on the South Side, but new affordable housing in Bridgeport and Pilsen, a Mexican neighborhood that has experienced much gentrification, made her consider a move to the South Side. “I want to continue to enjoy [Chicago] now that I have a queer community and I don’t have to give it up so soon,” she explains. Though moving isn’t an immediate concern, Roberts is giving some consideration to places outside of Chicago if she can’t afford to live in her preferred neighborhoods. “Pittsburgh is always on my list because I have family there so it’s easy, but it’s a really white city and I couldn’t even speak to the queer community there,” Roberts says. Justin White, 30, left Chicago in 2011. 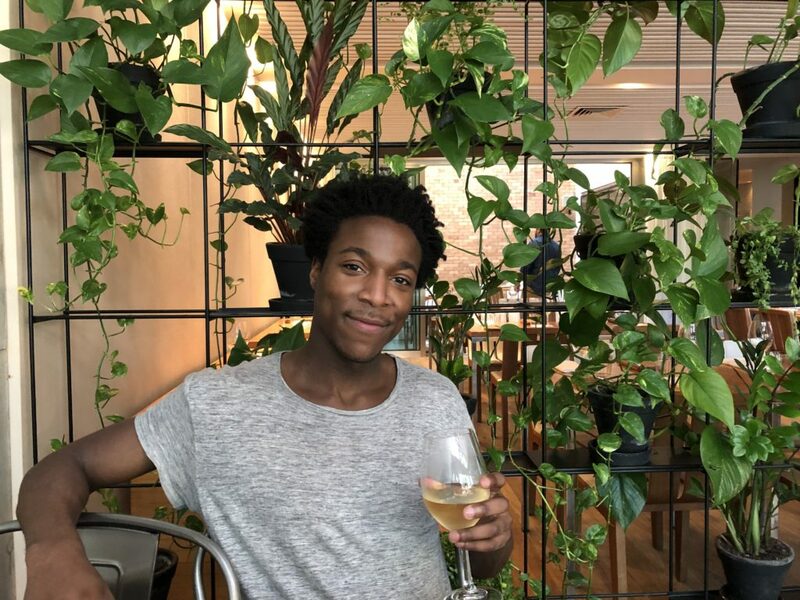 Born and raised on the South Side, he discovered an entirely new world in Chicago’s downtown while studying fashion merchandising at the International Academy of Design and Technology. As a student, he lived in Logan Square and Wicker Park in the late 2000s. White remembers the continual increases in rent each year back then. He, too, felt like he was being priced out of Logan Square. On the other hand, the North Side neighborhood gave him the freedom to live in his truth: a queer man who dresses alternatively. But he still found restraints in what he could and couldn’t do. “I was looking for more support in the art and weirdo communities. In Chicago, especially for Black people, there weren’t as many opportunities for alternative lifestyles,” White explains. Along with his struggle to find a full-time job in fashion, White ultimately did what he had to do. He moved to California where jobs in fashion are abundant. After a brief stay in San Francisco, White landed in Oakland where he found the mix of Black culture, welcoming queer communities of color and job stability that he desired. Still, White misses Chicago. The cost of living is much higher in the Bay Area than in Chicago. Also, Californians aren’t as warm, personality-wise, as Chicagoans. He sees himself moving back to Chicago in the near future. But he’s still unsure if he’ll ever call the South Side home again. Chicago’s violence narrative continues to dominate the mainstream media, and it’s that narrative that makes White fear home.